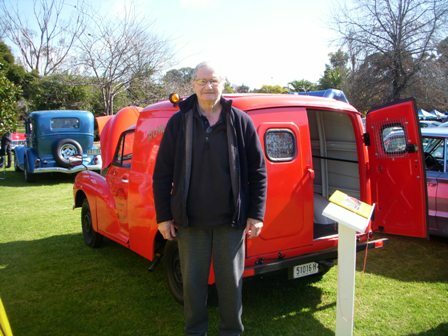 This is one of his last photos, it was taken at the Corowa Show and Shine 11th September. Saturday 13th April. The Mini Club will be holding a Fun Run with 95 km and 33 questions. Please note a Navigator is required in each car. Meet at St Ives 1-00 pm. Sunday 28th April "Pork Brake" We will be meeting at Bill Davidson's home, Mitchell Street, Albury at 10-30 am for an inspection and service of Peter Lenne's morrie's brakes. Lunch is planned for 1.00 pm., pork, roast vegies and salads. Please RSVP, Bill, phone, text or email by 21st so we can cater for the correct numbers and arrange who supplies which vegies. Beechworth Drive Back in Time, with the chance to diplay your Morrie in Ford Street. Meet at BBB, 8:30 for coffee with 9:00 drive off. 8-10 June (long weekend) "Morries on the Murray" at Echuca.